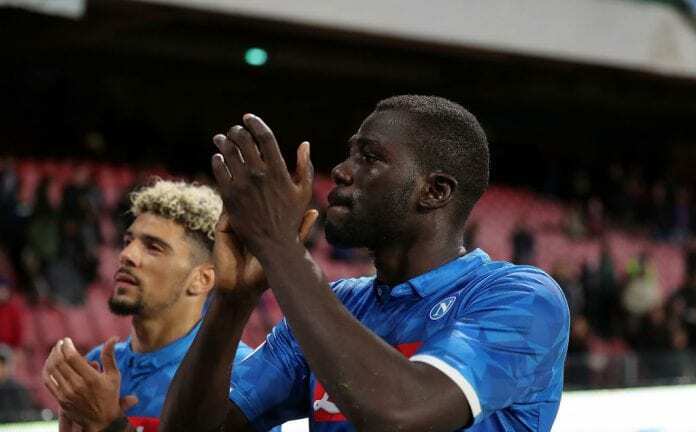 The Senegalese defender was subject to racial abuse in Napoli’s 1-0 Boxing Day defeat at Inter Milan with the home fans making monkey noises and other racist chants at him. Koulibaly was eventually sent-off following two yellow cards after Napoli coach Carlo Ancelotti attempted to call off the match three times. The Partenopei supporters took action this weekend by donning a picture of Koulibaly’s face with the message “Quelli del Sangue Azzurro” – “Those with blue blood” in the club’s 3-2 win against Bologna on Saturday. And Koulibaly, who was suspended as a result of his dismissal at Inter, was touched by the support that he had received. “The emotions of this day and this victory will remain forever in my heart: thanks,” Koulibaly wrote on Twitter. Arkadiusz’s Milik double had given Napoli the lead at the Stadio San Paolo before Federico Santander and Danilo put Bologna back on level terms. However, Dries Mertens’ late winner ensured Napoli would end 2018 with a victory. Ancelotti’s side, who remain nine points adrift of Serie A leaders Juventus in second, will next face Sassuolo in the Supercoppa on January 13.